by Emily Jackson. Oxford: Hart Publishing, 2012, 318pp. Paper. ISBN: 978-1-84946-179-5. Reviewed by Lawrence E. Rothstein, Department of Political Science, University of Rhode Island. Email: LER [at] URI.EDU. 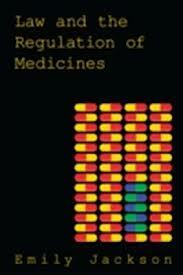 Emily Jackson, Professor of Law, London School of Economics, has written a comprehensive ethical/legal study of the shortcomings of the patenting, licensing and regulation of medicines in the UK. The book does a very complete job of identifying the problematic issues that affect the patenting, licensing and marketing of pharmaceutical products. The work includes extensive notes and bibliography. She also attempts to suggest solutions to some of the problems. The latter aspect is weak with regard to details and supporting evidence. From Jackson’s point of view, the overarching problem is that the system of regulation does not adequately counteract the effects of the pursuit of profit by the pharmaceutical industry. The system of regulation is too dependent on drug companies’ provision of information, both from clinical trials and after-approval monitoring of medicines. The overall effect of the patenting, licensing and marketing regulation is to promote the development of profitable medicines rather than safe, effective and inexpensive medicines. In this the UK and the EU regulation is little different from that in the U.S. The global reach of the pharmaceutical industry is an additional problem, particularly for developing and poor countries. While Jackson does attempt to outline the arguments of the pharmaceutical industry to meet these criticisms, the book often reads like a parade of horribles. Jackson supports the criticisms of the industry with both anecdotal and statistical studies while providing little supporting data for the industry’s arguments or for alternatives to the present system. I must disclose that I am not unsympathetic to her position. However, there is little detail on mechanisms for removing pharmaceutical company influence from clinical trials and after-market surveillance, particularly with regard to funding such efforts and assuring speedy availability of crucial drugs such as antibiotics. Jackson begins with the assertion that any substance which is to be marketed with claims to cure disease or relieve the symptoms of disease or injury should be subject to the same criteria of quality, safety and effectiveness as conventional medicines (p.1). This would include prescription medicines, “over the counter” medicines, generics, “me too” drugs and homeopathic and alternative remedies. In the UK, as well as the U.S., only the first two categories must meet the most stringent testing. Here the U.S. preceded the UK in instituting safety-based requirements for medicines, doing so in 1938, while the UK Medicines Act safety requirements did not come into [*72] force until 1971 (p.5). However, the regulatory regimes in both countries are highly segmented regarding the different categories of medicines. Under the British Medicines Act, EU regulation and U.S. and Canadian law, a drug company generally needs to show only that a new medicine proposed for licensing works better than a placebo. There is no need to show any advance over existing treatments. This leads to one of the major problems Jackson and others have identified. Drug companies have increasingly developed “me-too” drugs, drugs that offer the same medical effects as existing treatments, rather than drugs that provide any therapeutic advance. U.S. and Canadian studies indicate that new medications offering significant therapeutic advances are less than a quarter of drugs licensed since 1990 (Jackson, p.78; Outterson 2009, p.173). Furthermore, studies of patents for medicines indicate that they are ineffective in promoting innovation and are often used to extend exclusive rights by patenting inconsequential revisions in a product, a process called “evergreening” (Jackson, pp.81-82) A much higher percentage of pharmaceutical patents held by non-profit entities are innovative than are those held by profit-making entities, although non-profits hold many fewer patents (Bessen and Meurer 2008; Kesselheim and Avorn 2009, pp.179-180). Another aspect of the conflict of interest is the pharma firms’ control of information about the trials. This information forms the basis for decisions about the use of a drug once licensed. Unlike academic research where a finding of no effect may be as instructive as a strong finding of efficacy and peer reviewed publication is the usual requirement, negative clinical trial results are rarely published. Jackson notes that industry-run studies are eight times less likely to report negative trial results than non-industry funded studies. With regard to studies of anti-depressants in the U.S., published literature indicated that 94% of the trials conducted were positive, while the FDA found that only 51% of the studies actually had positive trial results. Furthermore, the drug industry makes [*73] sure that positive results of clinical trials are published multiple times in many forums. Many of these publications, including academic ones, are also dependent on industry donations or selling advertising space to the industry (pp.53-55). As mentioned adverse drug reactions and drug regime compliance problems are often only evident after a drug is on the market and in regular use. After-market surveillance is primarily voluntary reporting by patients, physicians, pharmacists or drug companies. Even where, as in the UK, there is an agency that solicits reporting of adverse events, they are underreported. Patients are not familiar with the reporting mechanism and are unsure of the causes of the health events that might be caused by their medication, particularly if the patients are extremely ill already. Physicians are also unsure whether the medication is the cause of an adverse event and avoid the paperwork of reporting unless they are certain of causation. Furthermore, many of the adverse events occur in off-label uses of medicines, voiding any duties of the drug companies to report the events (pp.103-109) Interestingly, Jackson discounts the effects of the tort liability system in the UK for revealing and curbing major adverse drug events, while suggesting that in the U.S. tort liability has been much more successful (p.125). Unlike the U.S., the UK bans direct-to-consumer advertising of prescription-only medications. But Jackson notes that drug companies get around this prohibition by “marketing the disease,” i.e. disease awareness “public service” advertising which hopes to get consumers to seek medical attention for the condition and perhaps ask for medications mentioned. In such advertising, specific medicines can be mentioned in the context of an overview of treatment options with no pricing information. Drug companies in the UK are lobbying for the allowance of direct advertising (pp.130-32). Pharmaceutical companies direct most of their advertising to physicians, using ads in medical journals, direct marketing, small gifts to physicians with company logos, and sponsoring continuing education opportunities. The distribution to doctors of free samples of medication is limited in the UK, unlike in the U.S (pp.146-150). The second additional chapter is on the philosophical arguments for and against the use of medicines to enhance well-being as opposed to treating disease. There is little new in this chapter over more comprehensive discussions by political theorists and philosophers such as Michael Sandel (2007) and Buchanan, Brock, Daniels and Wikler (2000). Jackson comes down mostly on the side of the liberal position espoused by Buchanan et al. that it is not helpful to distinguish between treatment and enhancement and the major ethical considerations are the effectiveness and safety of the use of the medicine in achieving the stated purpose and the distributional justice of who has access to the enhancement. There is little about the actual regulation of this usage (ch.9). This book may be most valuable to someone interested in medical research ethics. It does an excellent job of cataloguing the many pitfalls that a researcher sponsored by a pharmaceutical company is likely to encounter. It also provides numerous concrete examples of these pitfalls. The extensive bibliography will be valuable to anyone wanting to do further research in this area. The most disappointing aspect of the book is its failure to present a convincing case for specific reforms in the process. Bessen, James, and Michael J. Meurer. 2008. Patent Failure: How Judges, Bureaucrats, and Lawyers Put Innovation at Risk. Princeton: Princeton University Press. Buchanan, Allen, Dan W. Brock, Norman Daniels and Daniel Wicker. 2000. From Chance to Choice: Genetics and Justice. Cambridge UK: Cambridge University Press. Kesselheim, Aaron S. and Jerry Avorn. 2009. “Using Patent Data to Assess the Value of Pharmaceutical Innovation.” The Journal of Law, Medicine & Ethics. 37(2):176-83. Outterson, Kevin. 2009. “Symposium Introduction.” The Journal of Law, Medicine & Ethics. 37(2):173-75. Sandel, Michael 2007. The Case Against Perfection. Cambridge, MA: Belknap Press. Copyright 2013 by the author, Lawrence E. Rothstein.